To keep your teeth for a lifetime, you must remove the plaque and tartar from your teeth and gums every day with proper brushing and flossing. Scheduling regular dental visits are also important to prevent cavities and maintain good oral health. Daily cleaning and maintaining good oral hygiene will help keep calculus formation to a minimum, but it won’t completely prevent it. A frequent professional deep cleaning as recommended by your dentist is necessary to maintain dental hygiene and remove calculus from places your toothbrush and floss may have missed. 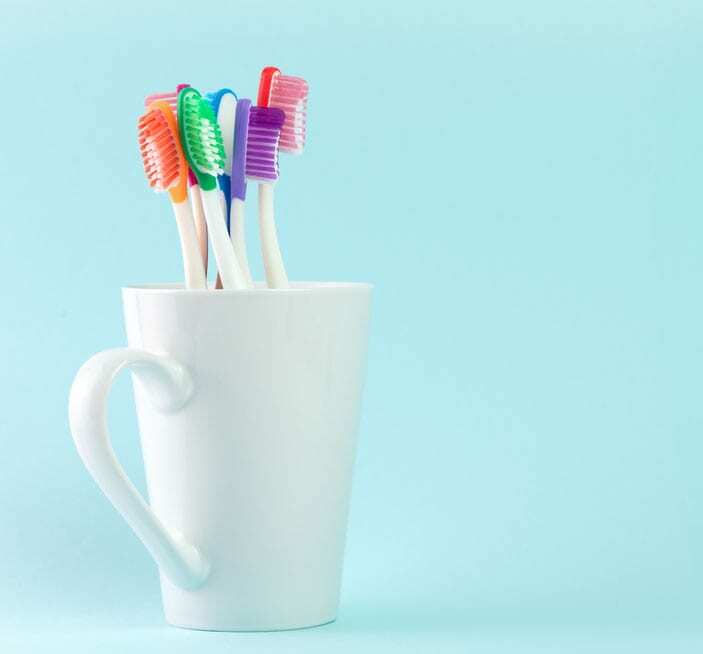 Begin with the right equipment – choose a soft-bristled toothbrush that allows you to reach every surface of each tooth while brushing your teeth. If the bristles on your toothbrush are bent or frayed, buy a new one. A worn-out brush won’t clean your teeth properly which may cause bad breath. To clean the inside chewing surfaces of the upper and lower front teeth, hold the brush vertically. Make several gentle back-and-forth strokes over each tooth. Don’t forget to gently brush the surrounding gum tissue. Next, you will clean the biting surfaces of your teeth. To do this use short, gentle strokes. Change the position of the brush as often as necessary to reach and clean all chewing surfaces. Try to watch yourself in the mirror to make sure you clean each surface. If you have any pain while brushing your teeth or have any questions about how to brush properly, please be sure to call the office. Periodontal disease is an oral disease that usually appears between the teeth where your toothbrush cannot reach. Flossing is a very effective way to remove plaque from those surfaces. However, it is important to develop the proper technique to keep up with healthy teeth. The following instructions will help you but remember it takes time and practice. Start with a piece of dental floss (waxed is easier) about 18″ long. Lightly wrap most of the floss around the middle finger of one hand. Wrap the rest of the dental floss around the middle finger of the other hand. To clean the upper teeth, hold the floss tightly between the thumb and forefinger of each hand. Gently insert the dental floss tightly between the teeth using a back-and-forth motion. Do not force the floss or try to snap it into place. Remember there are two tooth surfaces that need to be cleaned in each space. Continue to floss each side of all the upper teeth. Be careful not to cut the gum tissue between the teeth. As the dental floss becomes soiled, turn from one finger to the other to get a fresh section. 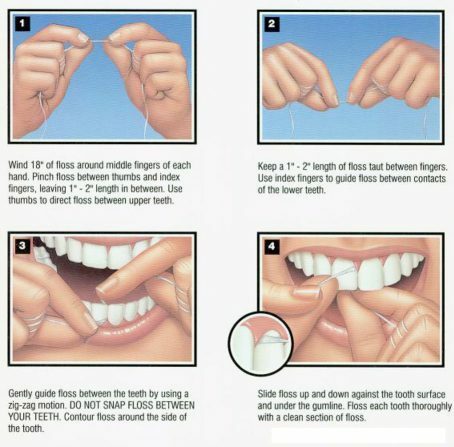 To clean between the bottom teeth, guide the dental floss using the forefinger of both hands. Do not forget the back side of the last tooth on both sides, upper and lower. Sometimes after dental treatment, teeth are sensitive to hot and cold. This should not last long, but only if the mouth is kept clean. If the mouth is not kept clean the sensitivity will remain and could become more severe. If your teeth are especially sensitive consult with your dentist. They may recommend a medicated toothpaste or mouth rinse made especially for sensitive teeth. 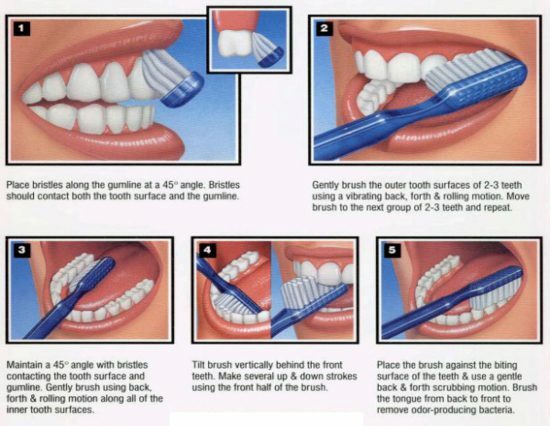 There are tiny brushes (interproximal toothbrushes) that clean between your teeth prior to brushing. Rubber tip stimulators are used to massage the gums after brushing. These oral hygiene aids are very effective in cleaning spaces that are developed between teeth after periodontal surgery. Fluoride toothpastes and mouth rinses if used in conjunction with brushing and flossing can reduce tooth decay as much as 40%. They are also effective in reducing tooth sensitivity to cold. Remember, these rinses are not recommended for children under six years of age. Tartar control toothpastes will reduce tartar above the gum line, but gum disease starts below the gum line so these products have not been proven to reduce the early stage of gum disease. If you have any questions regarding the appropriate type of oral hygiene products and how to utilize them, please ask us.